“This [is] NOT A Drill. This [is] NOT A Drill. This [is] NOT A Drill,” the Butte County Sheriff’s Department wrote on Facebook Sunday afternoon, urging residents of Oroville, California to evacuate immediately. 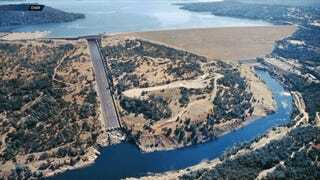 “Officials are anticipating a failure of the Auxiliary Spillway at Oroville Dam within the next 60 minutes,” wrote the California Department of Water Resources on Sunday night at around 5PM PST. This week, the emergency spillway was used for the first time since the dam’s construction in the 1960s when its main spillway began to erode, sending chunks of concrete flying down the damaged outlet. Update, 10:45PM EST: Butte County Sheriff Koney Honea told the Associated Press that the California Department of Water Resources does not believe the dam is eroding as fast as they originally thought. 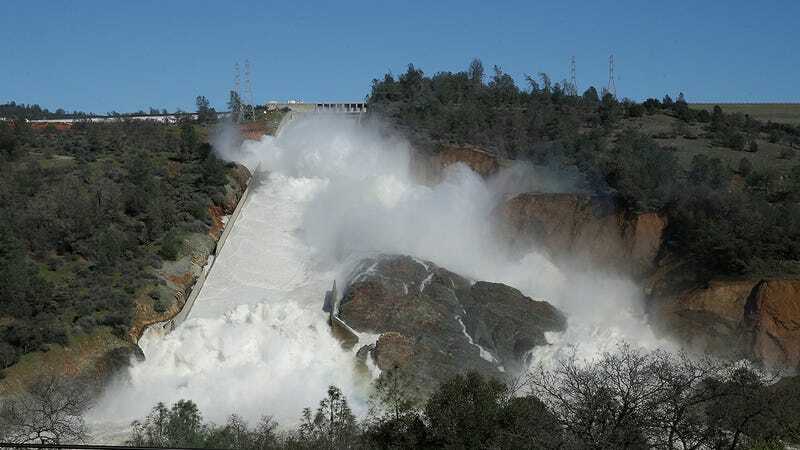 The evacuation order was issued after engineers noticed a hole in the spillway, in the event that “the worst-case scenario came into fruition,” said the sheriff. As of around 6PM PST, only two inches of water is overflowing from the dam, which is lower than earlier. Honea said there is a plan to plug the hole by getting a helicopter to drop rocks into the crevasse.